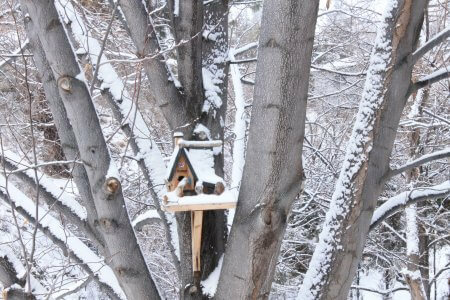 Our B&B guests frequently ask us about the winter here in Summerland. What better way to describe it than through a picture. 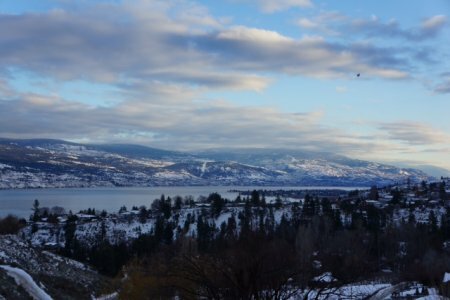 This picture was taken from our deck, overlooking the Okanagan Lake, at Christmas time by one of our favorite guests. Good job Jim! I also took this picture of the birdhouse in the Tulip tree, in early December. We don’t get a lot of snow here and its lovely dry, powdery snow. My neighbour tells me you can use a leaf blower to take it off the steps – she does! But the weather this winter has been COLD! At least in our 5 years experience living here, it has not been this continued cold temperature we experienced all through December. Minus 15 and it stayed there for days! On the bright side, it was clear and sunny a lot of days but too cold to go for our daily walk on the lakeside. Today its warm with a fine mist more like what we experienced in Vancouver; our snow has almost all melted away and the Christmas Rose is blooming in the front garden. And that, my friend, is Winter in Summer Land. Internet Marketing: Pinnacle Marketing Management Inc. | Visit Summerland!